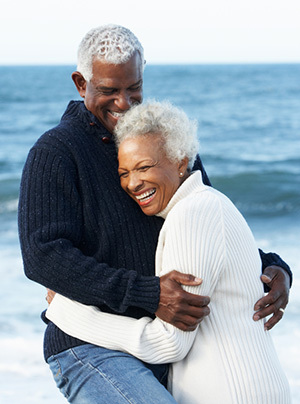 Dentures are a great way for patients to regain smiles that they love. If you are missing tooth due to decay, trauma, or disease, ask Dr. Szierer about your options for custom dentures. Partial dentures are generally connected to a pink, skin-colored frame. They contain just a few teeth to fill in the gaps in your smile. Full dentures are also available to our patients who need to replace a full row of teeth. These dentures rest on the gums and contain a full set of beautiful upper or lower teeth. Patients may also be interested in stabilizing their dentures with dental implants. Instead of resting on the gums or attaching to the surrounding teeth, implant retained dentures include a more secure foundation. Implant supported dentures rely on a series of strategically placed titanium posts to stay in place. These strong posts, called dental implants, are inserted into the jawbone surgically. They bond with the jawbone, like true tooth roots, to hold your new dentures in place. Implant retained dentures stimulate the jaw, thus preventing bone atrophy, a common side effect of tooth loss. Peace of mind knowing that your dentures will not slip or fall out of place while you chew, speak, or eat. Implant retained dentures do not cover the palate, allowing wearers to taste food naturally. Irritation caused by the instability of traditional dentures is eliminated. Which type of dentures will improve your life? Would you prefer traditional or implant retained dentures? Full or partial? Conventional or immediate? Dr. Szierer would be happy to help you make your decision based on your needs and goals for your smile. No matter which option you choose, we can guarantee high quality work that improves the overall quality of your life, as well as your oral health. If you are interested in replacing missing teeth or old dentures with beautiful custom dentures, contact Sophisticated Smiles today.